Never has a title captured a book more perfectly. SUNSHINE SKETCHES OF A LITTLE TOWN! I found that sunshine in a small, tatty orange Penguin book, but it’s not at all photogenic, and so I went trawling for images and I was delighted to find that there’s a lovely smart new edition out there. I didn’t know who Stephen Leacock was when I spotted my little book but his name rang a bell, and when I investigated later I found that he had a place in Simon’s 50 books you must read but may not have heard about. That was a very good sign. A little more research uncovered the fact that Stephen Leacock was a teacher who tried a little writing, with a little humour, to supplement his salary. And that he was so successful that a medal for humour bearing his name has been presented for nearly seventy years now. Another very good sign. But there’s no better research than reading, and so I read! The twelve sketches tell stories set in the fictional town of Mariposa. It might be based on one particular town, but it’s presented in such a way that it could be any number of towns, and there are many things that will strike a chord with anyone who has lived in a small town pretty much anywhere. It did with me. There’s Mr Smith, proprietor of Smith’s Hotel, a man perfectly suited to the business of hospitality. There’s Mr Thorpe who is a successful speculator but knows that he is still needed as the town barber. There’s Dean Drone, who loves the classics but has to lift his nose out of his book to deal with church finances. There’s Peter Pukin, a bank teller from out of town, who is besotted by the judge’s daughter, who is far too caught up with dreams of romance to even notice his existence ….. They are introduced with a very natural humour, the humour of a good raconteur who knows to tell his story with warmth and wit, pointing out all of his characters quirks and foibles, and maybe exaggerating them just a little bit. It was evident that he knew and loved them. There are stories of events too, and these have a richer vein of humour. And, I suspect, rather more exaggeration. A bank raid where a man is killed. Or maybe seriously injured. Or maybe a bullet just whistled past his ear ….. A whirlwind campaign that the town isn’t quite ready for ….. And best of all a boat trip that ends with a sinking in less than six feet of water and a daring rescue by the town’s lifeboat crew …. I don’t often fall for comic stories, but I fell for these hook line and sinker. But writing about them or pulling out quotations really doesn’t seem to work. You need to read one. And once you’ve read one you’ll probably want to read another and then another, until you’ve read all twelve. There are plenty of old editions out there, the book is in print, there’s a free download, and it’s short. So if you like the idea of Sunshine Sketches there really is no excuse …. I’m so happy to hear that enjoyed Stephen Leacock! He is one of my favourite writers, and couldn’t even be ruined by the fact that we studied Sunshine Sketches in school. His humour is gentle as if he’s laughing at himself as much as about his subjects. Times, they change. . .but Leacock’s humour seems ageless. I read that assertation from the Canadian Encyclopedia and I can quite believe that Stephen Leacock was so well and widely known. And yes, his writing does seem ageless; it is still wonderfully engaging and I couldn’t have put an date on it. It is lovely. I’ve spotted a few penguin copies of his books on my travels, so hopefully you’ll spot one too one of these days. Like Debbie, and all Anglophone Canadians of a certain age, we read Sunshine Sketches in school, and I think everyone remembers The Sinking of the Mariposa Belle. Mariposa is apparently based on Orillia, Ontario, if that’s any help. That cover illustration looks more European to me than small town Ontario at the turn of the 20th century. Thank you for that link. The town on the cover does look to have a smaller square as its focus, and a different character, but hopefully it will catch new readers’ eyes. Sounds wonderful! I just got a free download from amazon… thank you. Excellent! I’ve downloaded a couple more books on the strength of this one. I think I would have picked up the book just on the strength of the title and it being a numbered Penguin, but it was lovely to have the assurance of Leacock being a favourite of yours. He has the 2011 slot in my century. And so another Leacock fan is born! 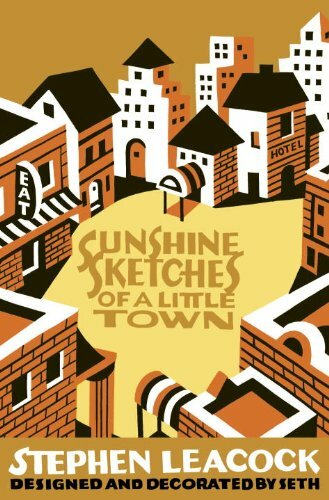 Sunshine Sketches is by far his most famous book but everything I have read by him has been wonderfully entertaining. And he is very, very useful for A Century of Books! What a lovely title! I’ve never heard of this author now, thanks for reviewing this one. I am going to have a look at the free download. I remember being Grade 8 and being asked to read out loud “The Marine Excursions of the Knights of Pythias”. I couldn’t do it because I kept breaking out laughing and another student had to finish reading.It wasn’t all in vain. I eventually became an English teacher. Here is some information from the CBC on a recent television adaptation of the Sketches.